DEADLINE: Registration deadline is May 12, 2011. Training, a certiﬁcate of completion, a 3“ thick course materials binder containing the presentation and other valuable CASp study materials. 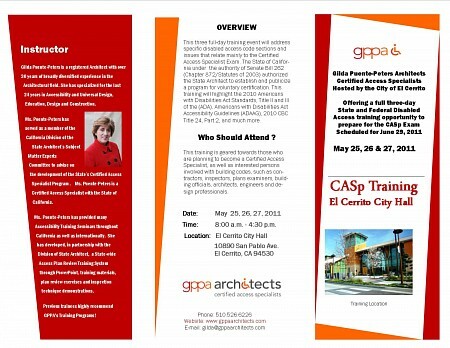 This training qualifies for Architect’s mandatory training for License Renewal. AIA CEU’s can be self-reported. Refreshments will be provided.